Forgive my new obsession with neon but how can you not love these bright colors? I know they make everyone happy. So embrace them and don't be afraid to make a bold statement with neon. I was super excited for this DIY because when I saw these shoelaces in the store I had no idea what on earth I was going to do with them but I bought them anyways. But when I saw this Aurelie Bidermann Necklace I immediately thought of my neon shoelaces for some odd reason. I'm glad I did though. 1. Cut 2 lengths of your shoelace. One should be how long you want the necklace to be and the other should be 1.5 cm shorter than that. 2. Lay both pieces next to each other. Place the thread under one piece. 3. Bring it over and put it under the other. 4. Put it over and under again. 5. Repeat steps 2-4 until it looks like this. 6. Tie a knot at the back and cut the embroidery thread. Repeat steps 2-6 on the other end of the 2 pieces. 7. Remove all excess thread put glue on the ends to avoid fraying. 8. Tie the chain to both ends of the shoelace. Apart from making this necklace another one of my accomplishments this week was making a pinterest account. Please follow it and I will try my best to follow back! It's look amazing! Great idea! HA! How clever!!! I'm loving some of your DIY ideas!!! Really clever and original! What an awesome necklace! You make it look so easy! Cute idea! 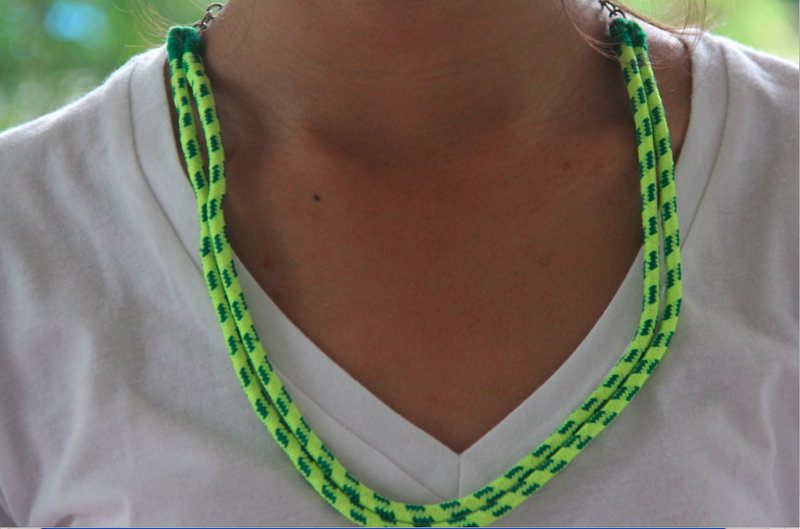 Loving your neon necklace! I love ur blog!!! this diy is so simple but so great!!! easy to try!!! it makes a great necklace or even a bracelet!!! I just have to find a neon rope like this! This is so easy to make and so creative! Love the neon yellow color! I like your neon necklace so much! This DIY is really gorgeous! i'm goin' to do that! I love it!! great job hun!! What a great and innovative use of an everyday item! I have some neon rope that I have trying to figure out what to do with and this might be the perfect project. For some other DIY projects check out my blog.